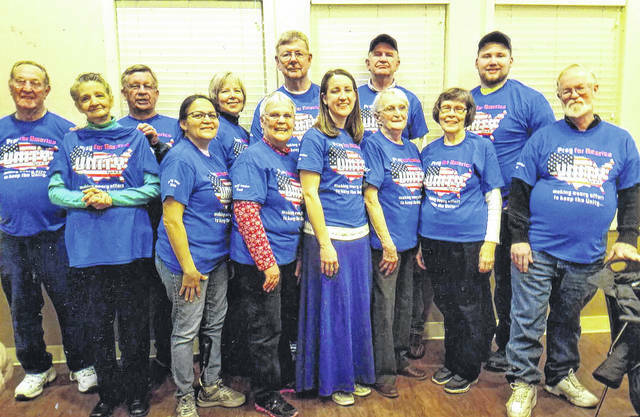 National Day of Prayer Fayette County Task Force members wear the 2018 t-shirts displaying this year’s theme of endeavoring to keep the unity of the spirit in the bond of peace. For several years the Fayette County Task Force for the National Day of Prayer has used t-shirts as a “billboard” to advertise the upcoming event. This year’s theme is “Pray for America – Unity.” It’s right there on the shirt. The theme comes from Ephesians 4:3 which says, “Endeavoring to keep the unity of the spirit in the bond of peace.” Ephesians 4:3 is right there on the shirt too. Even the back of the shirt has a message. It reads “NATIONAL DAY OF PRAYER.” The American flag is also represented on the shirt. The group wants people to know about the upcoming event on May 3. People will come together on that date in all 50 states to pray for our country and its leaders. We thank God that we have this freedom. https://www.recordherald.com/wp-content/uploads/sites/27/2018/04/web1_img003.jpgNational Day of Prayer Fayette County Task Force members wear the 2018 t-shirts displaying this year’s theme of endeavoring to keep the unity of the spirit in the bond of peace.